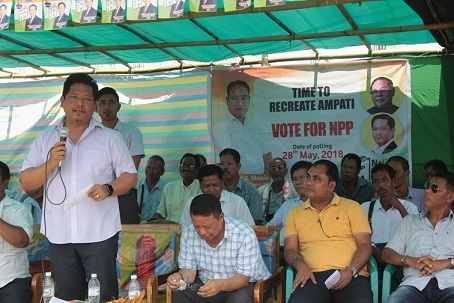 Meghalaya Chief Minister Conrad K Sangma on Friday campaigned for the by-election to Ampati constituency to drum up support for NPP candidate Clement G Momin. He instilled hope in the people that if NPP candidate wins, the party will work with renewed energy to recreate Ampati and take forward growth and development projects. He expressed surprise that Ampati dubbed as a development constituency was still lagging behind in the field of education, health care facilities, and opportunities for the farmers and the youth. “During Indira Gandhi’s regime, the Congress party was ruling in majority of the states but under Rahul Gandhi and Mukul Sangma, the party has been reduced to only two states,” Conrad K Sangma said. He said NPP is a new party but it has Government in three states including Manipur and Nagaland. “The Congress era is over. People are rejecting the Congress everywhere not just in Meghalaya,” he added. He addressed three election campaign rallies on Friday accompanied by Chief Advisor to the Chief Minister Thomas Sangma, CEM of GHADC Dipul Marak, Deputy CEM Dolly K Marak, Bajengdoba MLA Pongseng Marak, ex-MLA of Songsak constituency and NPP secretary Nihim D Shira, Siju Rongara MLA Rakkam A Sangma, ex-BJP candidate of Ampati constituency Bakul Hajong, amongst others. He also addressed rallies at Chirinpara, Bandalkona and Kumligaon. Urging the people to vote for NPP candidate, the Chief Minister enlightened the people to vote for a ruling party, which is committed to bring about development. “We have faith in the voters of Ampati constituency that this time they will vote for a change. NPP is ruling and Clement G Momin will have access to the government and voice the concerns of the people of the constituency, unlike the opposition,” Conrad said. He said NPP is a party that works for all communities irrespective of their cultural and religious background and would take everyone in the path of growth and development. “It is not possible for an MLA from the opposition to bring in development,” he said. “People of Ampati had faith in Mukul Sangma for 25 years but he failed them and left the constituency. He claims that after this by-election Congress will come to power which is a distant dream. He is responsible for rift within the Congress and after this election he has to fight with his own MLAs to retain the position of the opposition leader”, he said. Ex-MLA of Songsak constituency Nihim D Shira said Mukul Sangma had failed to set up a Government College in Ampati because he is afraid that if educational infrastructure and facilities are improved he will face competition from many other educated candidates. NPP candidate Clement G Momin cautioned the people not to be afraid of Mukul Sangma, as he is no more in power. Momin alleged Mukul Sangma has the habit to threaten the electorates. “During February election, he threatened the people that if they do not cast votes in favour of Congress then all schemes will be scrapped and people will face lot of difficulties. Today he is no more Chief Minister, why should we listen to him or get scared of him,” Momin said.